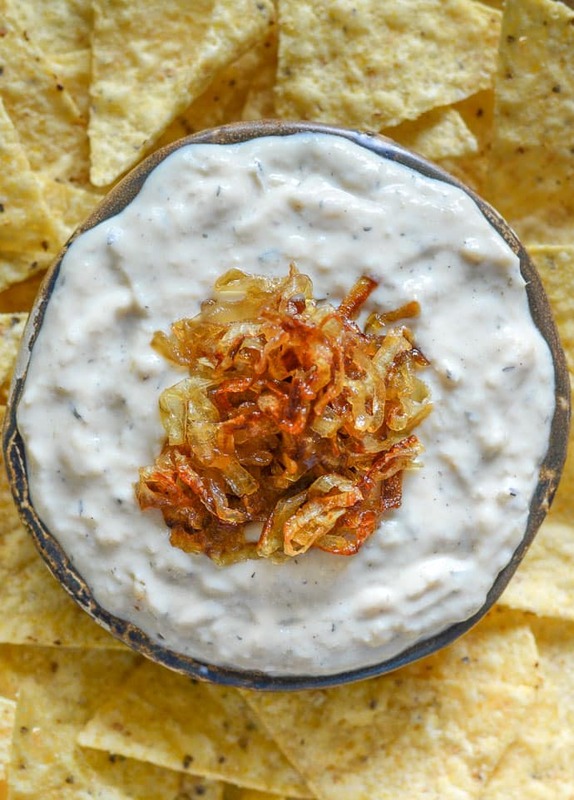 A deliciously cool, creamy & nut-free Vegan Onion Garlic Dip. Full of sweet roasted garlic & caramelized onion flavour & perfect for your next party! 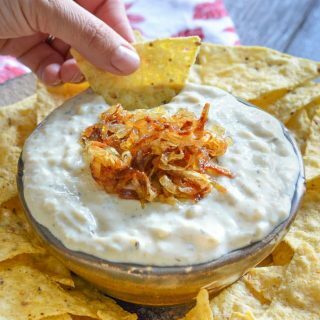 You guys, I’ve made you a dip just in time for your summer parties! In Canada we have our 150th birthday to celebrate this weekend, then, a few days later, our U.S friends celebrate the Fourth of July. Partying a-plenty, drinks a-flowing, and you know what happens then? The munchies. Without fail. 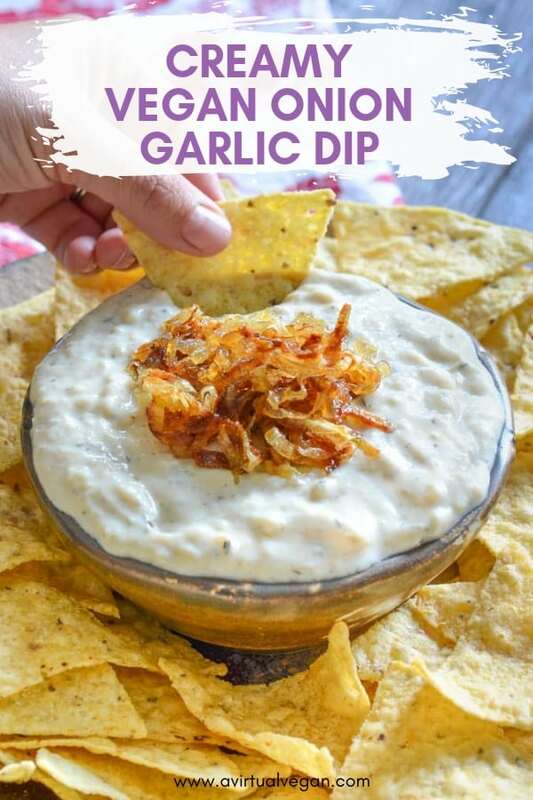 So keep your guests (and yourself) happy by making a big bowl of deliciously Creamy Onion Garlic Dip and surround it with your favourite dippers. I am thinking tortilla chips, bread sticks, raw veggie sticks and warm homemade pita bread.???? 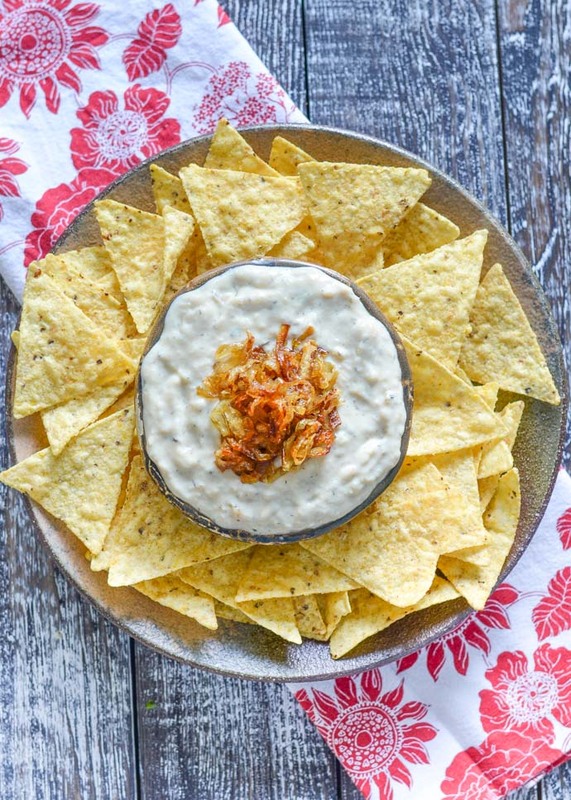 Unlike a lot of vegan dips, this Creamy Onion Garlic Dip is nut-free. Rather than use cashew nuts to make a creamy sauce, I have used silken tofu instead. 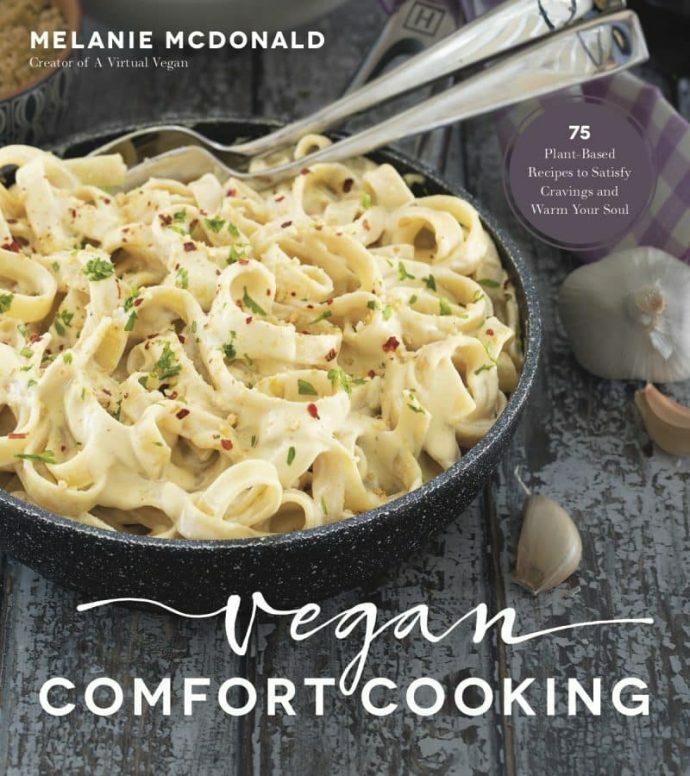 I have many vegan tofu recipes, and have used tofu to make smooth, creamy sauces many times, like my Easy Vegan Cheese Sauce, but I had never used it to make a dip until now. It’s a basically flavourless base, but because we want the garlic and onion flavours to shine with no distractions it is just perfect. And those flavours really do shine.☀️ We’re talking garlic roasted in the oven until it’s super soft and sweet. Slowly, and I mean really slowly, caramelizing the onions, then blending them all up with the silky soft tofu, a touch of thyme (plus a few other things) until we have garlicky oniony dip heaven. A pile of crispy caramelized onions finishes it all off rather nicely. The trick to getting the very best possible flavour is slow cooking the onions. It makes them super soft and sweet with a deep golden colour and I can’t stress enough how important it is. Their golden strings are literally packed with flavour by the time you have finished. The same with the garlic. Roasting it in the oven changes garlic so much. It loses it’s pungency and becomes mellow and sweet with a texture almost like soft butter. Totally off track but if you are ever in need of a really yummy snack, roast a whole head of garlic as per my instructions here, squeeze it gently from it’s papery skins, and spread it on crusty toasted bread. Sprinkle with a little sea salt and devour. It’s seriously amazing! Now back to the Creamy Onion Garlic Dip which, after all, is why we are here. If you give it a try let me know what you think in the comments below and share your pics on Instagram. Use my hashtag #avirtualvegan so I won’t miss it. Ok, so you’ve got this dip thing right? Good, because all this talk of dip has made me hungry. I’m ready for a snack and have a bag of tortilla chips and a half eaten tub of Creamy Onion Garlic Dip to finish……???? 2 teaspoons olive oil , make the dip oil-free by sautéing the onion in a few tablespoons of water instead of oil. it will be more difficult to get them really caramelized though so oil is the best option. Keep the garlic head all in once piece and slice about ¼ inch straight off the top of the whole garlic head exposing the inside of the cloves inside. Have a quick look at this guide if you are sure about how to do this. Take a square of tin foil and put the garlic head cut side down in the middle of the foil and wrap it tightly. Bake in the oven for around 40 minutes. After this time check it. It should be really soft if you give it a squeeze. Give it another 5 minutes or so if it's not. Once completely soft remove from the oven and allow to cool in the foil. While the garlic is roasting, heat a sauté pan over a medium low heat with the olive oil (or a few tablespoons of water). Once hot add the sliced onion. Cook slowly for around 30 minutes, stirring frequently. If you use water you will need to add a few drops more here and there to stop the onions sticking. Once the onion is really soft and starting to go golden, add the sugar (optional but recommended for a more caramelized result) and stir well then continue to cook for another 5 minutes or so until a deep golden brown then remove from the heat and set aside. Add the tofu, nutritional yeast, white miso, vinegar and salt to a blender. Take the roasted garlic head and gently squeeze the garlic out of the papery skins and into the blender along with half of the onion and a few drops of the milk. Blend until completely smooth. Check the consistency and add a little more milk if you prefer a slightly thinner dip. I used a full ¼ cup but you might prefer less. Add the thyme and the rest of the onion and stir to distribute. If you prefer it completely smooth you can blend all the onion up into it. I like having some of the golden strands through mine for texture. Optional : Garnish with more caramelized onion or some fresh thyme leaves. Will keep for up to 1 week if refrigerated in a sealed container. Looks amazing! Making it right now :) Have you tried baking this and serving it warm? Wondering how that would turn out. I haven’t tried baking it. Sometimes tofu can go a bit funny when baked so if you do try it, bake it on a low heat and take it out when it’s just warm. Hopefully then you will avoid that happening. This looks DELICIOUS! I will definitely be making it. Completely agree with you about water-sauteéd onions; they just don’t fully brown or caramelize. But, this is what I do every meal prep day: I oven-roast chopped onions, plain, on a giant sheet pan lined with parchment paper at 375 degrees for about twenty minutes, stir around, then go about 10-15 minutes more. Then I let them cool and pick out any small dark-brown pieces, and voilá: oil-free roasted onions with way more depth of flavor than the water-and-skillet method! They’re delicious in and on everything. You don’t have to. It will still be nice, it just won’t have exactly the same depth of flavour. Thanks. I did make it and it turned out very good! Absolutely delicious! I love it. It could have used more lemon juice because it was not as tangy as sour cream, but I love it exactly the way it is. Great! So glad you enjoyed it Sheila! 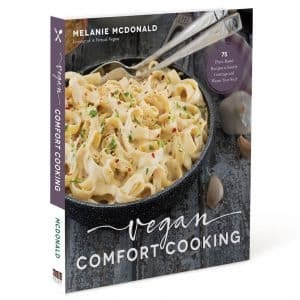 Hi, I’m really excited to try this recipe! Did you use soft silken tofu or firm? As long as it’s silken any firmness will be ok. Hope you enjoy it! Wow I love it! We have made it twice now. Thank you for the recipe! Onions are so yummy when they are caramelized! This was absolutely delish! Thank you! You just can’t beat caramelized onions. And the smell when they are cooking is so good! Is there something to use instaed of tofu for people who Can’t have soy???? I haven’t made it with anything other than tofu. I almost tried it with a nut base, but every-time I do that with a recipe I get so many people with nut allergies asking for alternatives. I thought this time I’d go with tofu so they could all enjoy it for a change. Plus it’s much lower in fat this way which helps out another group of people. You could certainly blend up some cashew cream though (cashews and a bit of plant-based milk) then add the onions, garlic and seasonings to it. Hope that helps! This is a great onion dip! Thanks for the recipe. 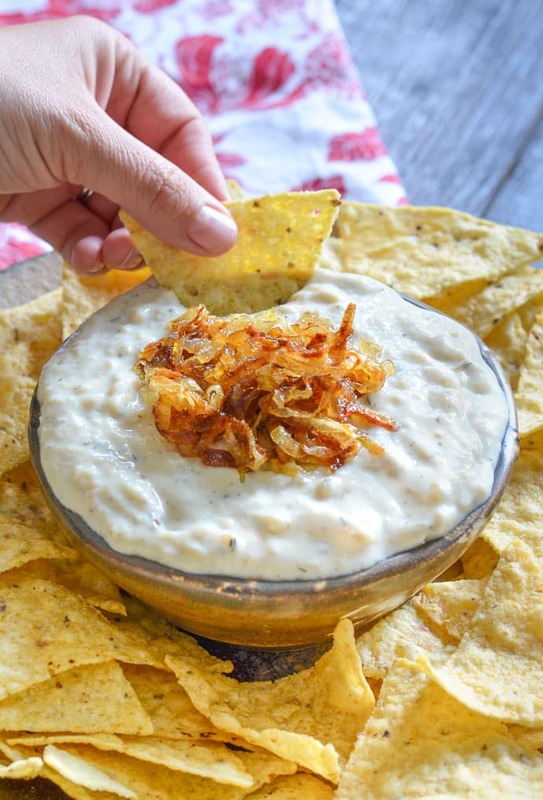 This is one amazing onion dip! 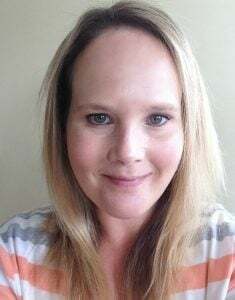 Thank you Amy! Glad you enjoyed it!